The scientific library of the Center for Ecological-Noosphere Studies NAS RA was founded in 2003. The library serves both the CENS researches and MSc and PhD students of Environmental Protection and Nature Management Chair of the International Scientific-Educational Center NAS RA. 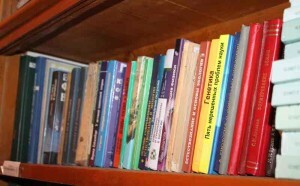 The library’s stock includes 1896 printed items covering diverse areas and particularly natural science, agriculture, geography, general ecology, environmental pollution, nature management and environmental protection, ecological education and culture, risk assessment and ecotoxicology, author’s abstracts of dissertations. The CENS library has been an ELCA member (Electronic Library Consortium of Armenia) due to which the Library possesses EBSCO Host full-text databases and Springer Link resources. Collaboration with the Consortium supports a short-term use of rating databases such as Edward Elgar Publishing”, “JSTOR”, “Jacek Lewinson – Publishers’ Representative Central/Eastern Europe”, “HeinOnline Core Package EIFL” , “Index to Foreign Legal Periodicals”, “International Monetary Fund”, “De Gruyter”, “Credo”, “Sage Knowledge” and assures free access to electronic libraries of Universities of Cambridge, Chicago, Oxford.